adidas today announced the launch of the Predator Instinct range, the latest incarnation of the iconic Predator football boot and timed to coincide with the 20th anniversary of its original release. The Predator, made famous by players including David Beckham and Zinedine Zidane, has been re-imagined in a design that celebrates the heritage of the boot alongside the animalistic instincts of the players that wear it. The 'Predator Instinct' boot launches the range with a return to the classic red, white and black colourway. The new technological features of Predator Instinct mean the boot remains all about control. The biggest innovation comes in the form of a revolutionary control frame, which extends around the boot and down onto the forefoot, ensuring ultimate levels of grip, touch and control of the ball - ideal for quick dribbling and change of direction. Precision engineered materials including a new gel pad and hybridtouch material provide optimum control and comfort, while the new TPU outsole ensures greater flexibility of movement. The design patterns of the Predator Instinct range is inspired by the predatory animals that use their instinct to hunt. This instinct ties into the attributes of the players who wear Predator such as Mesut Özil, with anticipation, touch and vision vital to control the game. 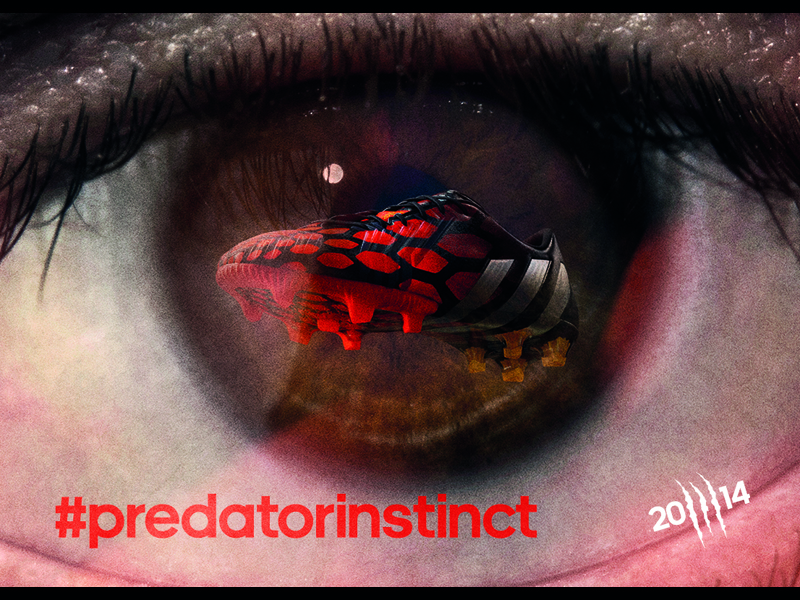 The new 'Predator Instinct' serves as a physical embodiment of these qualities in football and in nature. In its 20th anniversary year and to celebrate the previous 14 generations of Predator, adidas is releasing 14 new versions of the Predator Instinct during 2014. This includes Revenge Instinct, a heritage set of three Predators based on the original designs of the 1994 Predator, the 1998 Accelerator and the 2002 Mania. A special Solar Blue edition of the Predator Instinct is also available to buy exclusively from Intersport (in Intersport markets only). Players to wear the exclusive Solar Blue colourway of the boot on field will include Edin Dzeko, Xavi Hernandez, Andrea Poli & Julien Draxler. In non-Intersport markets, the Solar Blue colourway will be sold via other selected retailers. Some of the biggest global footballing stars, including Mesut Özil will wear the boots when they return to their clubs after the 2014 FIFA World Cup Brazil™. The boots are available to purchase from tomorrow (17th July) at adidas own-retail outlets as well as specialist stores worldwide. For further information please visit adidas.com/football or go to facebook.com/adidasfootball or @adidasfootball on twitter to join the conversation.